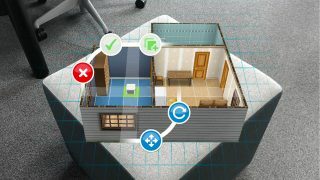 Take a first-hand look at the new AR feature which allows players to see their Sim’s Dream Homes come to life. Brilliant Backyards has arrived! 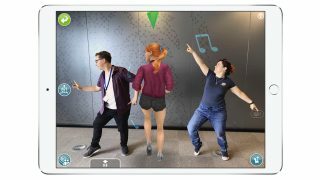 In the latest The Sims FreePlay seasonal themed update, players can now transport their Sims universe into the real world, and even share in real-time co-op building with a friend, thanks to Apple’s ARKit 2 technology. With iOS being the biggest AR platform in the world, hundreds of millions of users have access to ARKit. 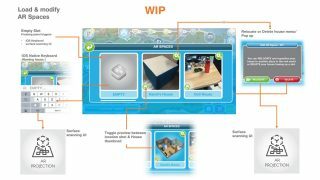 We sat down with Brandon Meester and Chris Brousseau from The Sims FreePlay development team to learn how Augmented Reality was implemented into the game. Hi Brandon, Chris what is your role on the team? Brandon Meester: I am a Software Engineer on The Sims FreePlay, I was the lead Engineer on the AR feature introduced in the Brilliant Backyards update. Chris Brousseau: I’m a Senior Product Manager for The Sims FreePlay. We’re both located at the EA Firemonkeys studio in Melbourne, Australia. 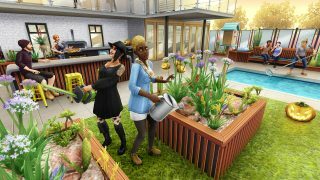 What are some of the new visuals and features that players will experience in The Sims FreePlay Brilliant Backyards? Chris: This update offers a whole new “Fall/Autumn” seasonal take on your Sims’ DIY backyard projects. From birdhouses to stylish plants to an amazing outdoor kitchen and a fun water feature—all content is beautifully themed for the season. Plus, we have reruns of our favorite Halloween Seasonal Quests coming up which means players can have their usual spooky fun. We’re also introducing Fashion Stockings for Simmers to add to their Sims’ outfits—perfect for pre-winter styling. How did the team arrive at the decision to expand the game and develop The Sims FreePlay in Augmented Reality? Chris: During WWDC18 when Apple announced their new features for ARKit 2 which was the ability to save and load areas in the world, as well as multiplayer, we got to thinking how we can use this in The Sims FreePlay. After discussing it with the team we thought, wouldn’t it be cool to be able to place houses and Sims in the real world? Imagine if you had Sims on your desk, and you could check in on them and see what they’re up to while you're at work? Or, if you could build a small gym and have your Sims work out with you while you’re at the gym? That’s how the concept started. Thanks to Apple’s Saving and Loading feature, players can save the creations they build in the real world, come back to them later, and they’ll still be there. How did the AR concept evolve from this initial idea? Chris: We thought it was a really cool idea, and as we continued working on the feature, we thought, “Hey, wouldn’t it be cool if we could build together?”. I saw people's eyes light up, so, we said “Yeah, let’s do it!”, and we got to work whipping up a prototype. Once we got multiplayer build mode in the game and we started editing and adding things to the same house within AR, we thought it was the coolest thing. Next, we put a lot of effort into making the experience the best it could be for our players. It was a lot of work, but it was well worth it and is probably one of the most fun experiences I’ve had with The Sims FreePlay. The ability to build all kinds of cool stuff in the real world and mix The Sims within reality was cool on its own, but once we got to do it together. Magic. How did the development team use research to build out the earliest versions of Brilliant Backyards? Brandon: AR was very new to us, so we had to learn a lot in a short amount of time. Our UX/UI Lead, Kamil Hamra, looked at how other apps used and presented the feature, including apps from the beta version of iOS. He also ran user testing in-house, trying out different ways of interacting and using the AR feature. We even looked at keynotes and presentations, anything we could find about AR really. What gameplay considerations did you have when implementing AR for the first time? Brandon: AR is very cool, but we really wanted to give the best experience to our players. We ensured players could scale up their house to real world size. Not only can you place your house on your table, but you can immerse yourself into your Sims world. With the Persistence AR and being able to share your AR World with others, we thought multiplayer was a must. It was either we ship AR + Multiplayer or nothing at all. Were there any challenges or barriers for the development team when creating the AR feature? Brandon: There were two big challenges: the first one obviously was to incorporate the AR technology into our game. It was all new to us, but it was very exciting. The second challenge, and probably the biggest, was to adapt our codebase to allow multiplayer gameplay. Our game had been a single player experience for almost seven years, so this was a big change. At least our QA team had fun testing and trying out the feature! What do you think AR means for the future of gaming, and what excites you most about the future of the technology? Chris: As AR becomes more and more commonplace I think that games will go in two ways. Some games will integrate an AR portion into their game to enhance the current experience, which is cool and it’s what we are doing. Others will release games that are AR only—and those will be interesting. At the moment, game devs are only just scratching the surface of what can be done with AR. As the technology improves, even more ideas and cooler things will start to shape up. Is there anything that you would like to expand on about the development process for Brilliant Backyards? Chris: Our goal was to completely enhance the outdoor build-mode experience, whilst still keeping content super fun to play with and seasonally relevant. We are so happy with how it has turned out and can’t wait to hear what our players think. 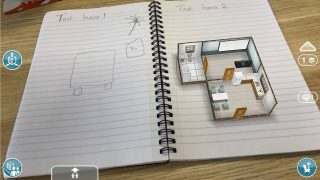 The new AR feature in The Sims FreePlay is a great example of something magical and unimaginable which wouldn’t have been possible without the iPhone and ARKit, and breaths an entirely new life into the beloved The Sims franchise. Transport your Sims with AR in The Sims FreePlay Brilliant Backyards*! Stay in the conversation of all things EA: Read our blog, follow us on Twitter and Instagram, and Like us on Facebook. *Network fees may apply. Includes in-app purchases. *The Sims FreePlay's AR feature is compatible with iPhone 6s or later, iPad Pro and iPad (2017).